Auntie Sim used to be a chef and owner of a restaurant before she moved to Saen Tor after marriage. She now supplies fresh-picked shrimp, cockles and other seafood to restaurants. She hosts together with Pink, a family friend who works at her family's custom jewelry export business. Pink and Auntie Sim are passionate about showcasing the unique culinary traditions of this beautiful, rural region of Thailand. Pink speaks English fluently and also serves as Auntie Sim's translator. In-home meal: (1-7 guests) You will enjoy seafood heavy dishes such as tom yum goong (prawns in a tangy, lemongrass soup), steamed mussels with Thai herbs, shrimp noodles, grilled or steamed blue crab in Thai seafood sauce (a blend of garlic, chilies, fish sauce, lime juice and sugar), crab curry (stir fried blue crab with curry powder), and som tam (green papaya salad) on Auntie Sim’s balcony. Auntie Sim can also prepare vegetarian options on request so please inform her if you prefer vegetarian when booking your experience. 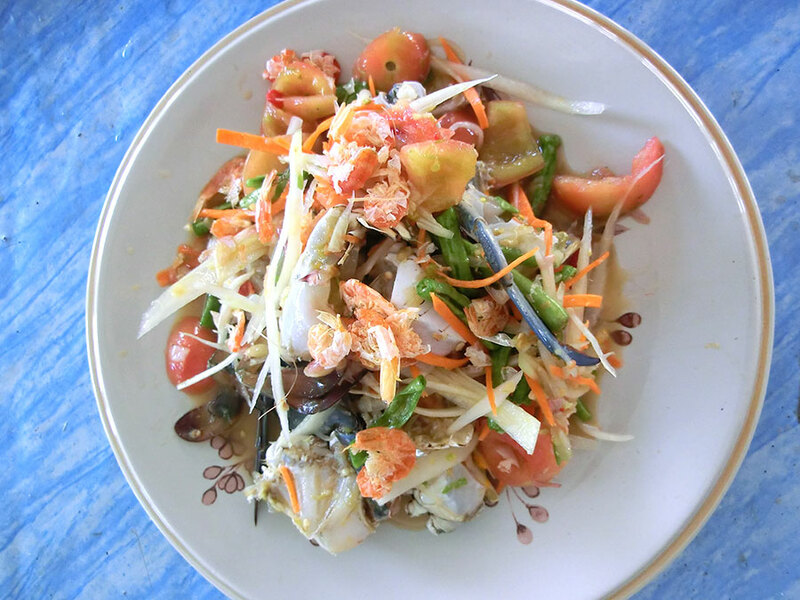 Cooking experience: (1-7 guests) Your experience begins with a visit to the mangrove forest to take in beautiful views of the Gulf of Thailand and get an understanding of the importance of mangroves in preserving the environment. You will then visit the local salt farm, a 10 minute drive away to learn how salt is formed (the best months to visit are Nov - April as it is the salt harvest season). Then drive back to the pier and take a boat together with Pink to visit the Saen Tor community and learn about the history and culture of this fishing village in the Bang Khun Thian district. Pink will take you to an organic seawater pond where shrimp, fish, crab, and cockles grow naturally. Wade in this seawater pond (100cms at its deepest) to pick cockles or explore via a kayaking trip. You can wash off after your swim before returning to Auntie Sim’s beautiful house right on the water with a great view of the bay. 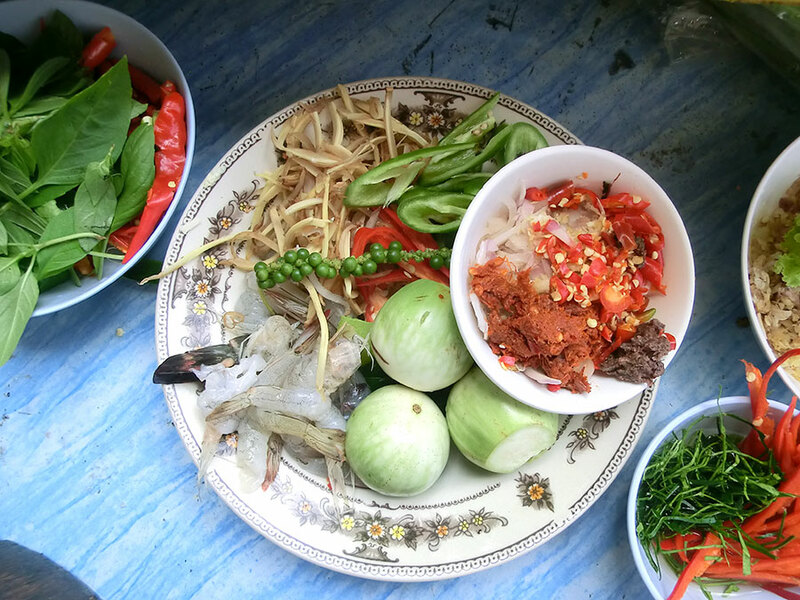 Walk through her garden and pick up Thai herbs to use in the meal that you will prepare together. 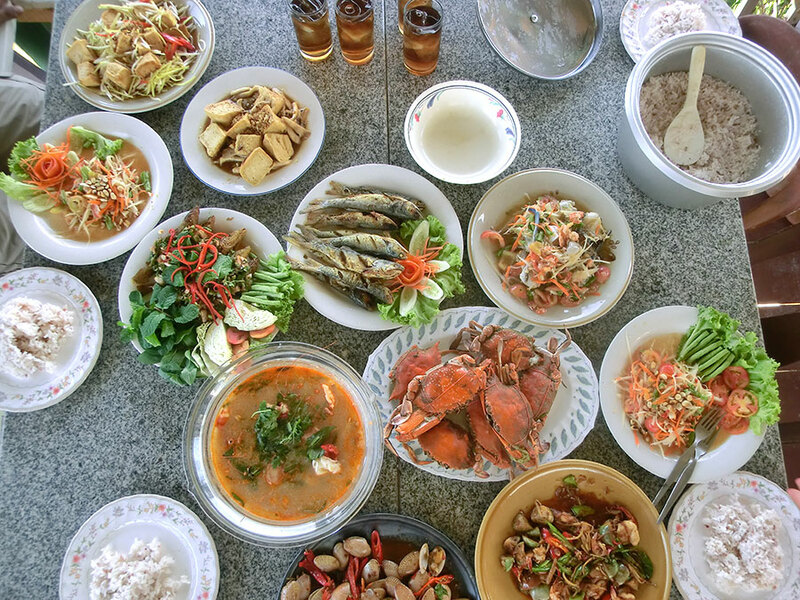 Learn how to make central Thai and Thai-Chinese dishes in Auntie Sim's outdoor kitchen. After cooking, you will go upstairs to their rooftop terrace and enjoy the lunch you helped prepare over delightful conversation as you look at the water. Notes: This experience is only available on weekends and is not suitable for children under 10 or older couples as you have to take a boat and climb up a bamboo ladder from the boat to the house. The experience cost includes transportation to and from the BTS Wuttakat Station, Exit 4. You will be picked up at 9am and dropped off between 3-4 pm. 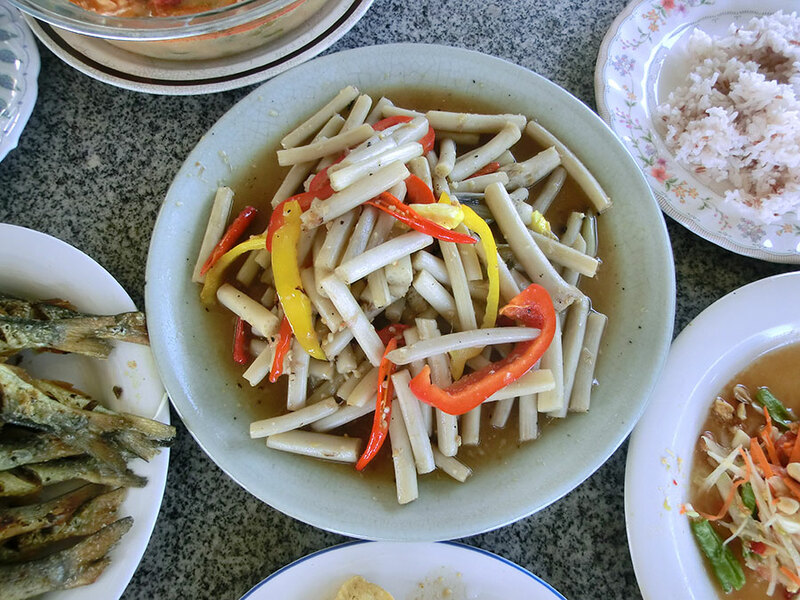 You will visit a mangrove forest and a salt farm before cooking and eating with the Saen Tor community. Auntie Sim and Pink offer a full day excursion (9:00am - 4:00pm, 8 hours) for an immersive culinary experience. If you would like to participate in activities like cockles and crab picking, we would suggest you bring along your swimming suit, towel, soap and other sun protection essentials - hat, cap, sunscreen, sun glasses etc. There is an outdoor shower where you can wash off as well as a clean bathroom that you can change in. Our hosts were very welcoming and accommodating, especially with our request for some vegetarian dishes. We had fun visiting and being able to ask them some questions about Thailand and its food. The location was great, a place you would only find if a local invited you to their home. This was a wonderful, unique experience that I can recommend to anyone who appreciates good food and great company. It was wonderful to get out of the city and see some of Bangkok's surroundings. 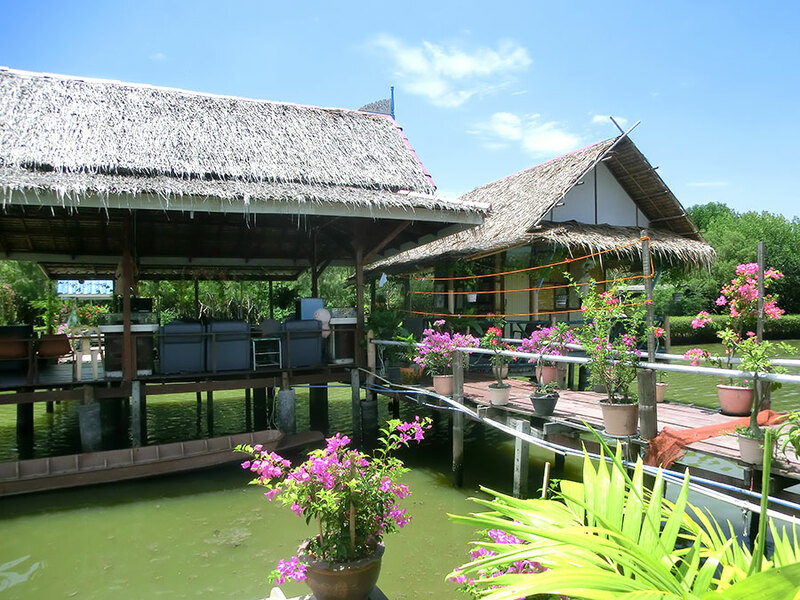 You have to take a water taxi and then cross a little bridge to get to Auntie Sim's place, which was the true highlight! 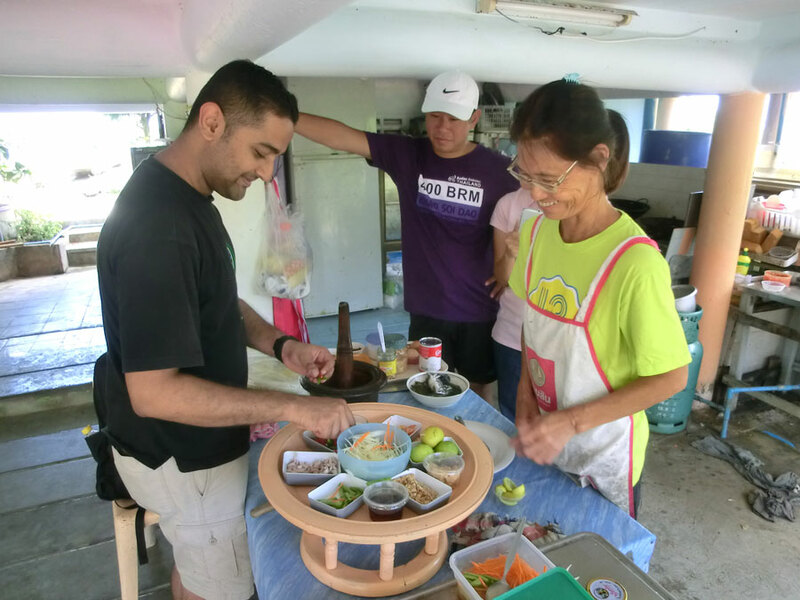 It was great to participate in the cooking process and Auntie Sim was a good teacher, explaining the steps and showing us exactly what to do and how much of each ingredient to put. What was also great, was that she was very accommodating of my vegetarian friend. 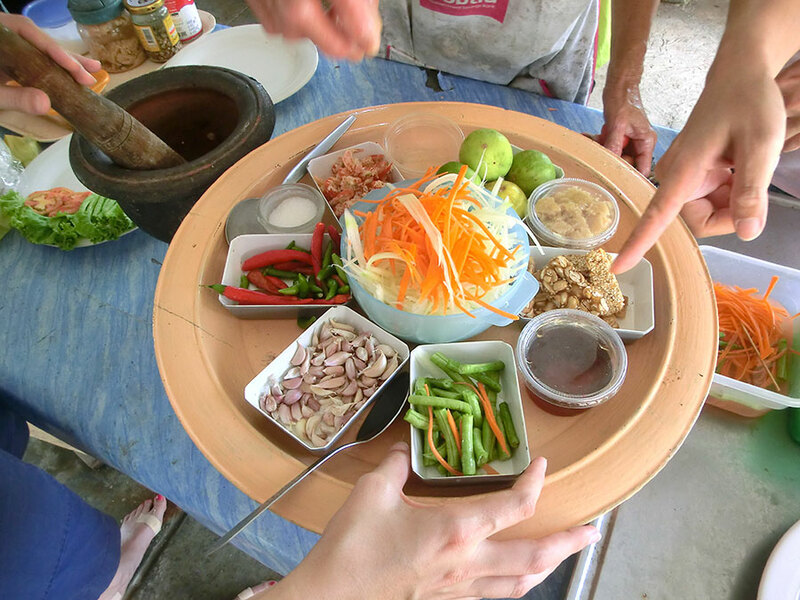 She even cleaned the wok and the som tam bowl before preparing the vegetarian dishes in them. After preparing a wide variety of dishes we went upstairs to their rooftop terrace and enjoyed our lunch with a beautiful view over the water. The food was absolutely delicious; everything was freshly bought the same day, the seafood caught that same morning.